This key tag provides a good life motto served at the most opportune time: as you leave your house each day. 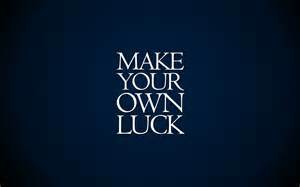 Make your own luck. The Pickwick is your childhood backpack all grown up. The canvas roll-top keeps its shape, and everything safely inside, no matter how much or little you stuff in it. Feeling competitive? Besides improving your hand/eye coordination, playing darts has been shown in studies to alleviate stress almost immediately. Our own research found that having such a well-designed board reduces the pain of boring white walls as well. Take a break without leaving your desk with this portable under-desk foot hammock. It’s adjustable so it can match your 4 p.m. slouch. Note: It ships from Korea, so be prepared to wait two to four weeks. This Hard Graft notebook is already gearing up for winter, with a soft wool cover and corresponding cognac leather case that’s big enough to hold the necessary supplies (pens, pencils, even a cell phone) without getting bulky. Previous articleDo Designers Need to Go to College? Next articleAre your assets generating income?